In yesterday’s press conference Mr Wenger confirmed that our Club Captain Mr. Arteta will be leaving this summer. When we signed Mikel from Everton he was 29 y.o. with much PL experience – it seemed a decent but uninspiring squad signing; at the time we had a young squad who needed guidance and, if nothing else, Arteta is a cool- head when the pressure is on. But …. I see the signing of Arteta as symptomatic of the lean years. He is a good player but he is not a great player. The usual epithet is that Mikel is a “model professional (MP)” which is just another term for journeyman – Mark Noble is a MP, Milner is a MP etc MP’s do not inspire, they are the water-carriers and every team needs one but the best teams have the best players and IMO Arsenal could have bought better. If a player is not good enough to earn a single cap for his country then they are not going to lead a team to the PL title. Part of the problem was that Arteta did not really have a set role, he was neither a DM nor an AM. Lacking pace, aggression and trickery he did not inspire but he was reliable – a much under-rated asset. Arteta seems a top bloke, he has wonderful hair, he appears unhurried on the pitch with an eye a pass. He takes a mean penalty. He captained the team to the FA Cup victory over Hull. 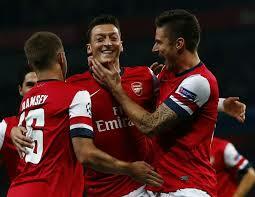 However, in the 5 seasons he has been at AFC he has played just over 100 games – slightly more than 20 a season. Why? Because since the start of the 2014/15 season he has played just 15 games. How will Arteta’s time at AFC be remembered? For me, it probably won’t be. I have always been underwhelmed by Arteta’s signing thinking that as likeable as he is, Mikel is not Arsenal quality..
Mikel Arteta has been Arsenal Captain which is surely the pinnacle of any player’s career. He was Captain during a turbulent period in the club’s history and did so with good grace, intelligence and panache. Arteta appears to be ideal manager material and has been taking his coaching badges. I wish him well and expect to see him back working at The Emirates sometime in the future. Are we asking too much of Francis Coquelin? There is no doubt that since his recall from loan at Charlton Athletic Francis Coquelin had a great impact on the team. Playing as the long awaited defensive mid-fielder, he has helped stabilise the centre of our team. He is very good at breaking up opposition attacks, winning back the ball and playing simple but telling passes to our more offensively minded mid-fielders. Having joined Arsenal in July 2008 he got a few games during that season and became a regular in the Reserves the following season 2009/10. He also played in the League and FA cups without really distinguishing himself. He then opted to go out on loan and played for Lorient, for the whole of the 2010/11 season before returning to Arsenal where he made his debut for the first team in the 8 – 2 defeat by Manchester United. At the end of the 2012/13 season he went out on loan again this time to Freiburg and then on to Charlton Athletic. At this stage it did not look as though he had much of a future at Arsenal. Since his recall last in December 2014 he has been a revelation, playing in the most difficult position he has become an “ever present” and established himself as one of the top defensive mid-fielders in the Premiership. Playing in the centre of the field as he does, there is a fine line between winning the ball with a clean tackle and being a fraction of a second late thereby “catching” the player and receiving a yellow card. His position is made harder by the fact that Arsene Wenger’s choice of Santi Cazorla as his partner leaves too much for him to do. Santi is a wonderful player but is not the most defensively minded of characters and too often drifts too far forward leaving Coquelin to fight the fires behind him alone. We have an excellent array of gifted, attacking mid-fielders, Cazorla, Ramsey, Ozil, Alexis, Oxlade-Chamberlain and, when fit, Wilshere. The temptation to fit in as many as possible seems to be too great for Wenger to resist. Consequently we see too often Coquelin fighting a lone battle in mid-field and picking up yellow cards on too many occasions. Sunday’s game against Crystal Palace being a case in point, only a surprisingly lenient referee allowed him to remain on the pitch to commit a further series of fouls even after being booked. If the present situation is allowed to continue opposing players will start to look for opportunities to go down at the merest touch and Coquelin will become a card magnet. Last season the manager introduced a slightly more pragmatic approach to defending, the result being a fine run into third position in the league and another FA Cup triumph. Perhaps it’s now time to take a step further and sacrifice one of the attacking mid-fielders in favour of, perhaps, Mikel Arteta to play alongside Coquelin. Firstly, there has to be a question and that is probably – Is Coquelin the natural replacement for Arteta and/or Flamini? I have said from when Mr Wenger re-signed Flamini that he wasn’t good enough to take The Arsenal to the title or the CL Final and these must be our targets. Nor is Arteta. Both fine players and experienced pro’s who have served the club with honour and pride but quite frankly they are both limited. We need better. Coquelin has been a revelation – most interceptions, most tackles etc etc in his short run of games and importantly he appears to be tactically disciplined. Plus he seems to be a pitch leader, unafraid to guide the players around him through the game. His tackling is strong and he seems to have eradicated his tendency to jump into tackles. – less yellows per game than Flamini or Chambers. However …. is he good enough? I mean can he be world-class? Can he be Ozil, Alexis, Koscielny class? Any really great side has a world class spine – think Lehmann, Campbell, Vieira, Henry or Seaman, Adams, Vieira, Wright. What do they have in common? 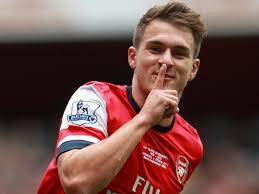 Yes, even you can see it is PV4, and it is Patrick who must be the benchmark for the future Arsenal lynchpin. Can Coq be that good? You tell me, but I have serious doubts. Doubts are not certainties and Coquelin has the perfect opportunity to cement his place in the Arsenal team. It would be marvellous if a lad who just 3 months ago looked Burnley quality can improve the team, it would be proof that hard work allied to ambition can overcome prejudice. I wish him well but would like Mr Wenger to be saving his money for another transfer raid on Southampton or even better to spend huge and sign Pogba. We need a central player to build the team around and we haven’t had one since Gilberto. The other day LB wrote an interesting post entitled “Is Thomas Vermaelen still needed? This led me to think about the player as a captain and conversely the captain as a player. Before looking at individuals in those roles I got to thinking just what should we look for in a Club Captain, note the capital letters, in my opinion the Club Captain is equally as important as The Manager, The Chief Executive or The Owner. So the candidate should be of sufficient stature, not just in a physical sense, but in the status he holds in the game as a whole. To attain the necessary status he must have been around a while, he must be a good enough player to command a starting place in the club’s first team and preferably in his National side as well. He should also have earned the respect of not only his own team but also opposing players and particularly the on pitch officials. Needless to say he must also be media savvy, articulate and able to offer rational answers to irrational questions at times of both elation and disappointment in post match interviews for example. Looking back, I can recall Frank McLintock, sleeves rolled up barking out orders to players, organising his defence at corners and free kicks and generally running things on the pitch. 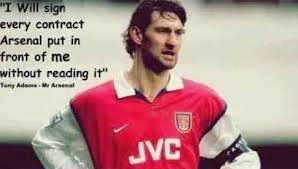 Similarly with Tony Adams and of course Patrick Vieira. Arguably the best Captain I ever saw was the incomparable Bobby Moore, calm authoritative and respected throughout football. Latterly the armband has been a bit of a poisoned chalice, not only at Arsenal but also at international level with England. Fabregas and van Persie were appointed only to depart shortly after, Vermaelen suffered both a shocking loss of form and a series of injuries and could soon follow the other two out of the club and there are rumours that Arteta could also go if someone of the stature of Khedira or Bender are signed. In the England team the captaincy has, disgracefully, been swapped around more times than at a kid’s game of pass the parcel. At the moment it appears to me that should Vermaelen leave, the only rational candidate would be Per Mertesacker, but for how much longer can he command that starting place in the team? Longer term we can all hope and expect the appointment of Jack Wilshire, but will it happen? What are your views on both the Captain’s role as, should it be largely ceremonial, tossing the coin, handing over a little pennant and posing for a snap with the officials or, as the Manager’s voice on the pitch and the players representative off it. Surely there must come a time when a stop is put to the absurd situation of referees being mobbed by a group of angry players, then only the Captain should be allowed to approach the officials, and that will require a calm sensible approach, one more attribute needed for the job. Who should our next Captain be? Old wine, or new bottle, or old wine in new bottle? End of the year, and part of the ritual is to take stock, and look forward towards the future with glorious plans and renewed expectations. And what a fantastic year this has been for Arsenal fans! At the midway stage in the Premier League last year, Arsenal was lying 7th, well off the pace for Champions League qualification, and even off Spursday football places. Qualifying second in their group, Arsenal faced a tough round of 16 encounter against Bayern Munich, one of the best teams in Europe at that stage. With significant changes to the Board, a new owner in tow, there were uncertain times for the club management. The fans were up in arms, with substantial ammunition provided by a negative press, dubious pundits and even the Arsenal Supporters Trust. Difficult times indeed! But Arsenal managed to make a fantastic turnaround. Attaining qualification for CL was nothing short of a miracle! 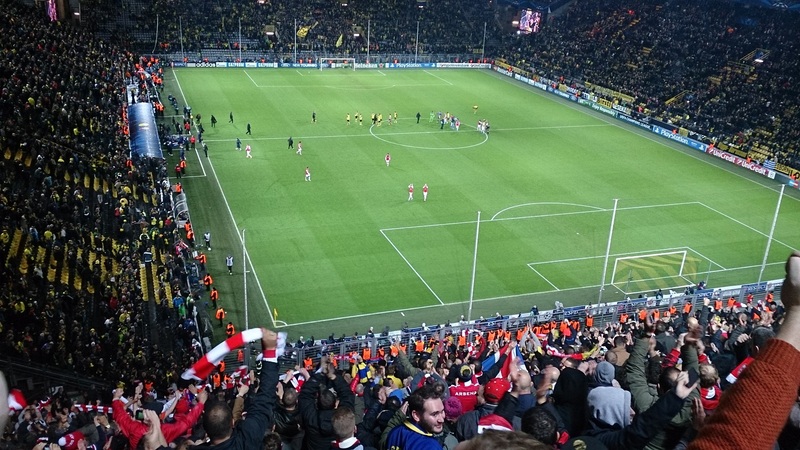 Yes, Arsenal lost out in a two leg epic battle against eventual winners Bayern, but before that showed their mettle in an amazing 2-0 away victory. Despite all the negativity, good progress was made in the summer transfer window. The progress continued in the current season, and Arsenal is sitting at the Top of the Premier League at the halfway stage. Qualification to the Champions League was gained from the aptly termed “Group of Death”. Grudging acknowledgement of Arsenal’s strength and mettle is gently arising from beneath the rubble of disdain and the green fumes of envy. Indeed, if the league was played over the calendar year, Arsenal would have been Champions of 2013. Oh, what a year this has been!!! All in all, a good year in prospect. There are plenty of challenges yet to be met. Plenty of time still before we even begin to celebrate the achievements of this team. But, also plenty of positive vibes and expectation in tow. So AA ers, looking towards the future, what did we learn new about Arsenal this year, and what were we reminded of afresh, that we did not know with so much certainty one year back? Let us discuss. Here are a few of my tentative suggestions. It was not all rosy, though. Injuries continued through the year. The squad seems a bit thin. Progression to the round of 16 in the Champions League was gained, but only in second place. Like last year, we have drawn Bayern Munich. Lovely games in prospect, but significant challenges as well. And if the vitriol from the fans is a bit subdued due to the sustained run of fine results and resilience in the field of play, the negativity from the press and pundits continues unabated. Perhaps most importantly, whether by luck or design, Arsenal continues to be at the receiving end of poor refereeing decisions. Alas, some things never seem to change! First, same time last year we did not know what a fantastic central defensive partnership, together with a very competent goalkeeper, we were developing. Indeed a large part of our success this year owes itself to the fantastic defensive pairing of Per and Kos. What a duo!!! And what a great leader in our beloved BFG! When Verms got injured, who would have thought we would have such a strong defence where even a fit squad captain cannot find a place? Second, one of the best revelations of the year was the discovery that Ramsey had developed into such a fantastic player. He was the subject of much of the blame and vitriol during our indifferent showing in 2012. Perhaps somewhat undeservedly. But our beloved Rambo rubbed all these adversities off his shirt, returned in style from his long standing injury, and has grown to the stature of one of the best midfielders in the League, perhaps in Europe as well. He has shown a very mature head as well, leading for his country at a very young age. In tow, Jack Wilshere is developing into a fine player, if somewhat idiosyncratic on occasions. Together with Theo, the Ox, Gibbs and Jenks, they also form a British core to the team which had been somewhat deficient for a while. Who would have thought a year back that Rambo would develop into such a fantastic and dependable player, and Jack’s game will be coming along so nicely as well? Third, one of the most encouraging developments of the year, at least for me, was the maturity with which the owner Kroenke, Gazidis and the Board conducted themselves. Perhaps the best development was that the Board did not interfere in footballing matters, leaving team and signing decisions to the people who know best, led by one Arsene Wenger. If you think that this is not a surprise, look around at other clubs. Several clubs have met with significant disasters as a result of owner power, such as the Spuds, Cardiff and even the Chavs, and in some others the environment is not very nice even if the performance has not been equally devastating. The principles of the club, that a fantastic team can be developed without wasting money on the wasteful purchase of overpriced bench idols, was not compromised by a new owner and a new look Board. Surely, this was not a given at the start of the year, after the club had gone through a rather aggressive ownership contest and change of hands. Fourth, amid the mantra of financial fairplay and traditional hesitancy to spend big money, and the recovery from an expensive move to the Emirates, who would have thought that Arsenal would spend their money where it mattered most? In the procurement of one Mesut Ozil, who despite his tentative adjustment to English football and the Arsenal way of playing the game, has given the team something really special, Arsenal showed purpose and ambition, and real ability to deliver trophies. 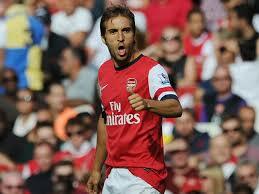 This came together with the free transfer of one Mathieu Flamini – ah, what a fantastic transfer move! Fifth, against the backdrop of significant unrest and disquiet among good-weather fans, ably supported by the press and pundits, who would have thought that the positive outlook of a sane fan-base would shine through? The struggle against the doubters and doomday-usherers still continues in earnest, in ArsenalArsenal and elsewhere, but The Home of Football still reverberates with the positive chants and outlook towards the new dawn awaiting in the New Year!!!! COYG! Onwards and Upwards!! A fantastic year 2014 awaits!!!! Where would 82 points put us in seasons past? Another great game of Football? Big night ahead. Can we really beat last season’s finalists at their massive ground? 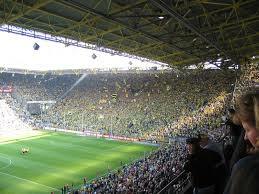 There will be 80+k fans in the Signal Iduna Park including two of our very own AA’ers and very excited they will be! Given the manner of our home defeat there is cause for cautious optimism – I really believe we can get something from the game. Two silly defensive mistakes cost us the points and we can be sure the Welsh Messi will not try and dribble his way out of trouble in our area again. 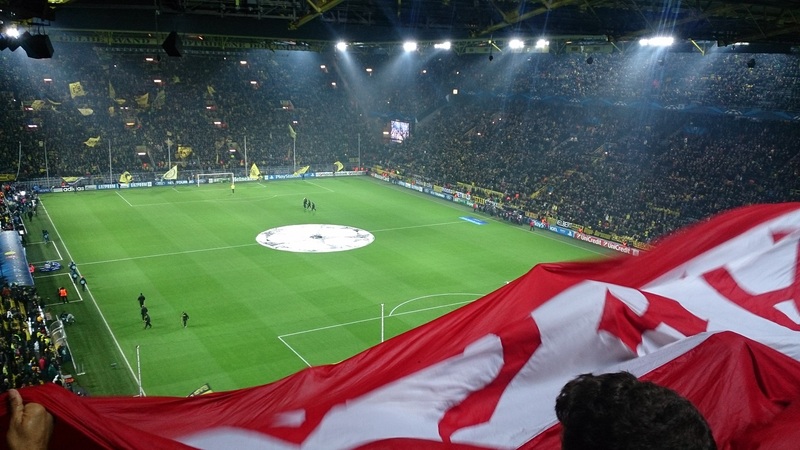 So – we have seen why Dortmund are so highly rated but they have seen why we smashed Napoli and the Scouse. Both teams will have respect for each other after the excellent game at THOF. Dortmund: As I gave a breakdown in my last BD post it seems superfluous to repeat it, but I must make mention of Lewandowski. One chance at THOF and he scored, a 16 minute hat-trick on Friday, 12 goals from 14 games so far this season, the man is on fire – the chances of his coming to THOF in January are almost non-existent. But is he as good as Ollie Giroud? Could he execute that flick to Wilshere in the goal of the month? I don’t think so. Another major threat is Marco Reus. Now here is a bloke who should be playing at THOF. Left sided attacker, 20 goals in 43 games for BD and 7 in 17 for Germany, 24 y.o. – perfect. Apparently Man Utd are trying to buy him, but who would want to go to that flea-pit when he is already at a bigger and better club? Klopp has been very complimentary about both Mr Wenger and Arsenal. 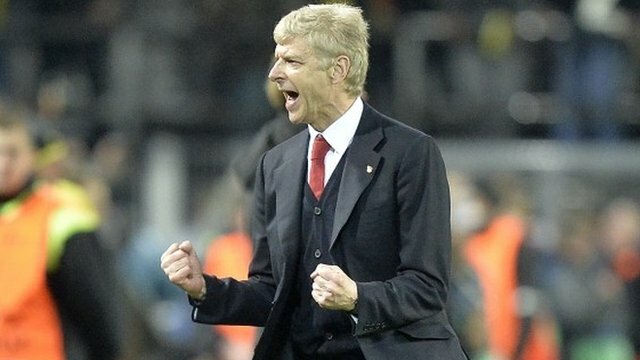 Stating that he should be Sir Wenger and that AFC have been the best English football team over the past 10 years, maybe he is shovelling it on in case of defeat, but who knows perhaps Klopp is sincere. Arsenal: Once again we have to talk injuries; Jack and Gibbs are out though thankfully we have excellent replacements. The absence of Flamini and the long-term absentee Theo are less easy to accommodate. Away in the CL is just where these two flourish. My concern tonight is lack of pace on the counter. On Saturday we saw Ramsey lead a counter-attack but the defender outran him and AR was forced to turn and pass back to an oncoming player. 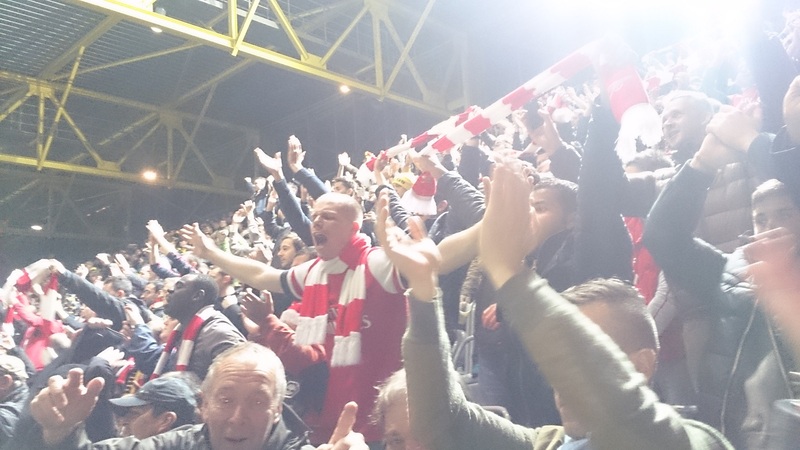 If Theo had been there then ……..
A major plus is the return to fitness of Santi. I love this bloke,his imagination is boundless. A repeat of Arteta’s fine game at the weekend and another lesson in hold up play from OG will be the keys to our success. We are still struggling for attacking options from the bench, hopefully Gnabry is fit enough to travel. The team showed on Saturday a determination and work-ethic which will hold us in good stead tonight. If we manage to press BD higher up the pitch we can do well tonight and given some luck and the run of the ball and a decent referee, then we can bring him the points. Why not? BR will be wearing a red jacket & Micky a red and white scarf – in case you are looking for us! p.s. Mickydidit and I will be your foreign correspondents at the stadium as, thanks to Chas ,we have tickets for the game. No doubt we will be full of bratwurst, sauerkraut and Lowenbrau as we look down upon our heroes. For most games Peaches has the armchair fans in her pocket as she cheers on the lads, tonight I can return the favour. Photos will be taken but probably not uploaded to the site until Friday.